Supports A3, A4, A5, JIS-B4, JIS-B5, Executive, Folio, Ledger, Letter, Legal, Tabloid (11" by 17") and Statement sizes. Paper (17 to 58#, 64 to 216gsm) may be used from the two drawers. 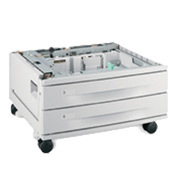 Includes two 500-Sheet Trays.